The Angry Birds franchise has had a hell of a ride on the App Store. Our involvement started with an email from one of the co-founders of the former-Angry Birds publisher Chillingo on November 26th, 2009 asking if we were interested in an exclusive announcement of their new game. Knowing what a ridiculous worldwide sensation the game has become since then, reading the rest of the email conversation is pretty insane, as we’re initially incredibly skeptical of the game and weren’t sure if we wanted to agree to posting about Angry Birds without way more information. Fast forward 5 years and 8 months, and such a thing is laughable. While Angry Birds mania has subsided a bit from their hay day of an Angry Bird being featured on nearly every t-shirt sold at Wal-Mart, the series is still going strong and following over three billion downloads across all the Angry Birds games, now seems as good of a time as any to release Angry Birds 2 (Free). Where to even start with an Angry Birds 2 review though? With billions of downloads, it’s safe to assume nearly every human on the planet knows what you do in an Angry Birds game… But, if you just stepped out of a time machine or recently were awakened from some multi-year catatonic state (Hey, stranger things have happened.) the basic gist is this- Dastardly green pigs have stolen the eggs of some birds, which in turn has made them angry. Naturally, the way said birds get revenge on the pigs is by loading themselves into slingshots and flinging into the ramshackle structures pigs seem to hang out in. Pop all the pigs, proceed to the next level, and do it again. That’s Angry Birds (Free). This formula has since been extended to a whole bunch of other games including pit stops in the Star Wars, Transformers, and Rio universes. 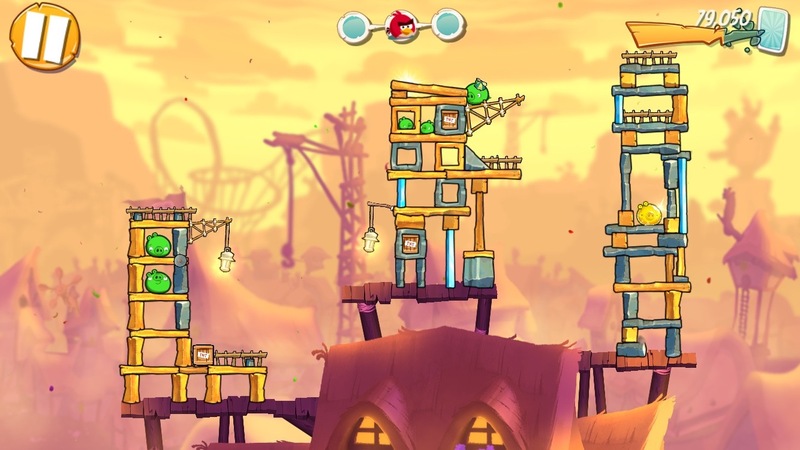 The tables have even been turned, with players experiencing the pig side of things in Bad Piggies (Free), another great, and often under-appreciated, game set in the Angry Birds world. So what’s so new and exciting about Angry Birds 2 that the numerous spinoffs and not-quite-sequels were missing? As far as core gameplay is concerned, not a whole lot, as you’re still flinging birds at pigs, but there’s been a whole lot of other stuff that’s been changed, tweaked, reworked, or otherwise improved. 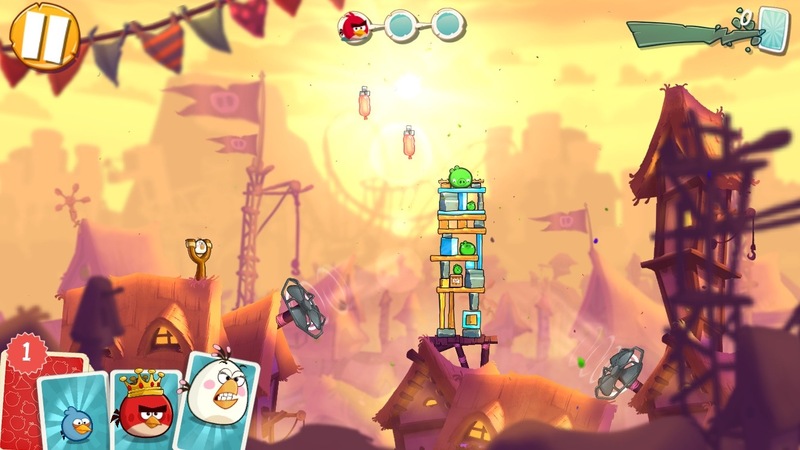 Most noticeably, the visuals in Angry Birds 2 are greatly improved. Both the pigs and the birds are far more emotive, particularly with the addition of a picture-in-picture close-up in the top left corner of the screen when you’re about to fling a bird which will show the bird grimacing in anger, or the pigs quivering in fear. It subtly changes the mood of the game from the old games which came off as sort of silly to “Wow, these pigs are terrified of these birds." 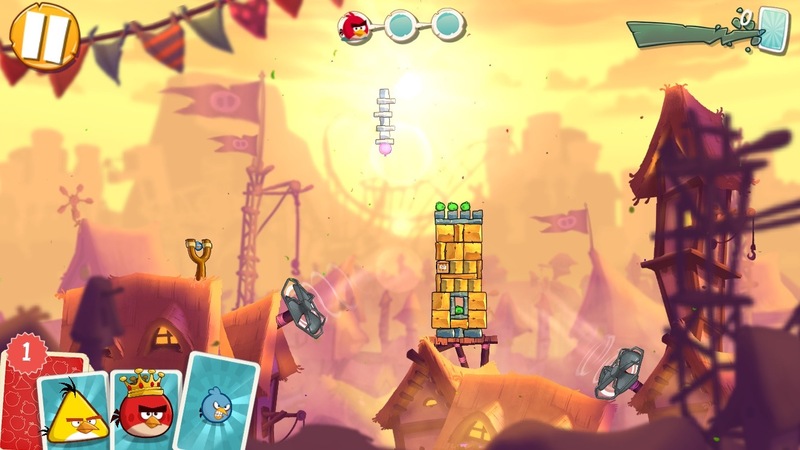 On top of that, instead of the simple parallax effects of previous titles, things in Angry Birds 2 feel significantly more three dimensional, particularly as good flings can result in both debris and pigs themselves flying directly at the screen. It’s not at all hyperbole to say this is the best looking Angry Birds yet. One of the more interesting changes to the game comes from just how much randomization Rovio rolled into the mix. Instead of pre-determined levels with specific birds, both the pig structures and your load out of birds is different with each retry, almost like the starting arrangement in Candy Crush (Free). 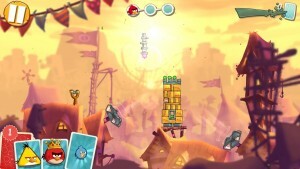 Take the above screenshots for instance, that’s the same level, loaded twice with totally different structures and birds. This has a drastic impact on the way you’ll play the game, as previously if you got stuck in an Angry Birds level all you had to do was load up a YouTube video of a specific level and shoot the birds just like they do. With every level and every retry being different, that sort of thing is out the window. It also serves to add loads of replay value, as instead of just banging your head against a level to get three stars, you’re forced to think on your feet with each retry. Speaking of retries, potentially the most controversial change in Angry Birds 2 is the addition of a Candy Crush-style life system. You’ll start with three lives, and every time you fail to make it to the end of a level, you’ll burn one of your lives. As of this time, they take thirty minutes a piece to regenerate. This change plays directly into just how much more free to play Angry Birds 2 is than any other game in the series. It’s got a lives system, power-ups, an in-game currencies, ads you can watch, perks for pestering friends on Facebook and all sorts of stuff you can buy ranging from continues to life refills. Of course, like most good free to play games, all of this is completely optional. You can go wild spending money and spamming friends, or you can just play it totally for free and just wait for your lives to recharge. Personally, I don’t mind the injection of all this free to play junk. Do I wish I could’ve just bought Angry Birds 2 for five or ten bucks and not deal with all of these shenanigans? Sure, but the App Store of 2015 is a very different one from the 2009 market that Angry Birds entered. These days, I have more great games on my phone than I have time to play in a single day. When I through my lives in Angry Birds 2, much like when I exhaust my supply in Candy Crush, I just play something else. Additionally, unless you’re just terrible at the game, you’re going to get a decent amount of totally free play time out of each set of lives- Particularly with the way the levels are structured now with different “rooms" you need to clear in each, complete with a new pig fortress to destroy. These free to play hijinx are ridiculously polarizing between people who don’t really care and people who think this sort of thing is destroying gaming as we know it. I’m on the side of, “Hey, this is a great game I can play forever without spending a dollar, that’s pretty cool." Exclusively looking at the gameplay of Angry Birds 2, this is the best Angry Birds yet. Throwing in additional randomization spices things up a bit, the “boss fights" are really neat, and all the other little additions here and there (Like fans, flowers that spit blocks for some reason, and other strange things) make playing the game a ton of fun. I feel like it’d be equally easy to argue that this is the worst version of Angry Birds yet too, with all the free to play shenanigans ruining everything. It’s highly subjective, really personal, and all a matter of perspective. I’ve been having a fantastic time with it, so it’s really easy for me to highly, highly recommend checking out.